A sterling cast enlivens NINE LIVES ARE NOT ENOUGH (1941), a 63-minute Warner Bros. "B" movie. As a frenzied "newspaper movie mystery" unspools, one by one the great character faces roll by: Thurston Hall, screaming into a phone as Matt's publisher...Howard Da Silva, also screaming into a phone as the city editor...Edward Brophy as a dimwitted cop, with James Gleason his long-suffering sergeant...Cliff Clark (Inspector Donovan from the FALCON mysteries) as the homicide detective...a young Charles Drake as a hapless newspaper photographer...and WB stock company stalwart John Ridgely as a car mechanic. 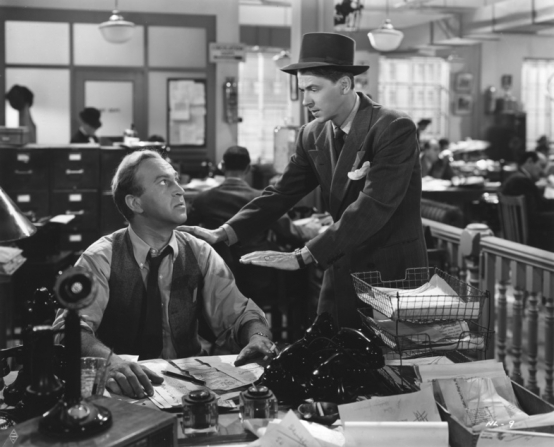 There's even young, uncredited Joan Leslie in two very brief scenes as the newspaper's receptionist, the very same year she starred in SERGEANT YORK (1941) and HIGH SIERRA (1941). This was the last film starring Joan Perry, who married Columbia Pictures head Harry Cohn the same year. Perry plays Abbott's daughter, who's charmed by Reagan's reporter, once she gets over him taking a picture of her identifying her father's body. There's more on Perry in my review of BULLETS FOR O'HARA (1941) and in my review of the biography of Allan "Rocky" Lane, who was once married to Perry. Faye Emerson, who does a great job in a flashy role as a chauffeur's wife, would, like Perry, have a high-powered husband. In 1944 she married Elliott Roosevelt, son of the President of the United States. Their union lasted until 1950. During a chase scene there's a great stock footage shot of the intersection of Hollywood and Highland. Anyone who watches a lot of movies will also recognize many of the streets from the Warner Bros. backlot which appear during the final chase sequence, such as the building pictured here which I photographed during a tour last spring. This is by no means a great movie, but it's a fun, fast-moving flick for those who love the wild and wacky world of newspaper movies. The great visual tour of the Warner Bros. backlot also makes it very worthwhile for a fan of classic-era films. I enjoyed it. 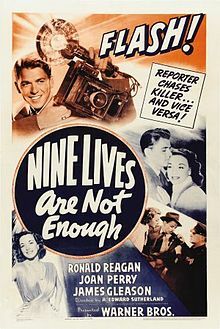 NINE LIVES ARE NOT ENOUGH was directed by A. Edward "Eddie" Sutherland (SECRET COMMAND) and filmed in black and white by Ted McCord. The screenplay by Fred Niblo Jr. was based on a novel by Jerome Odlum. NINE LIVES ARE NOT ENOUGH is not on DVD. It has been shown on Turner Classic Movies. What an unusual title. Sounds like a film worth seeing. Great cast.